I have been having some brain blasts which have made my days a bit easier. Yesterday morning, I woke up with the idea that I needed to go to Walmart and get some $0.88 water bottles. Hallelujah! That has really solved my water cup problem! I only have to refill each cup once a day! However, it seems to have made the coming in and out problem quite a bit worse. I suppose I need to either get used to flies, or figure out a way for the kids to get hydration without having to come in every 5 minutes. Another genius idea I had was to organize "School Time" or quiet time as the littlest ones are sleeping. After lunch, T goes down for a nap, and J eventually does as well. 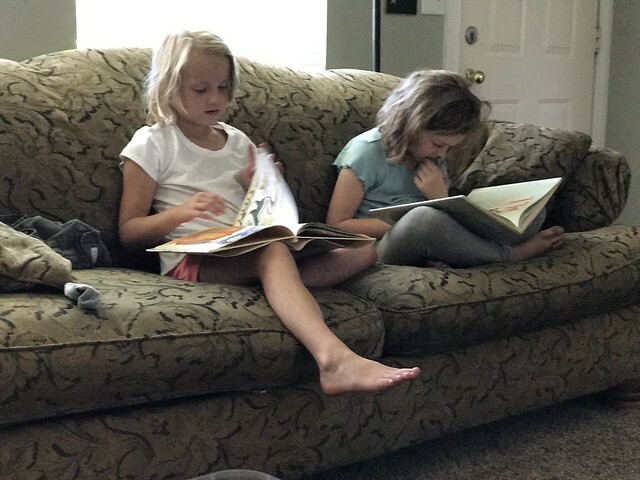 I have really been struggling with figuring out how to get the kids to stay quiet during actual quiet time. It is a real struggle. 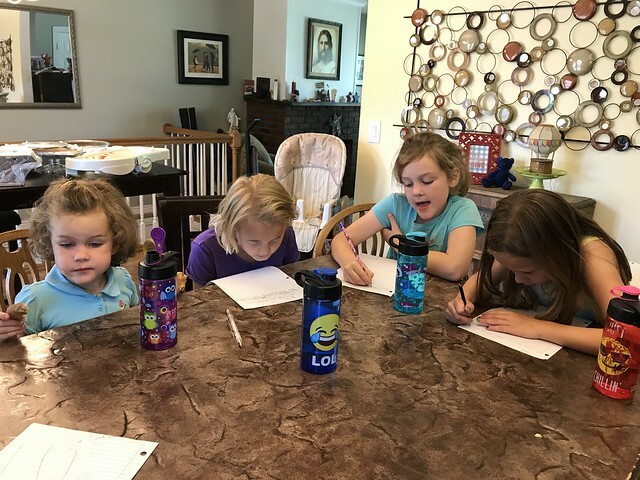 I started School Time on Tuesday, and it went like a dream! I gave the girls and Keith a blank lined paper and told them to fill it out, paying attention specifically to handwriting. 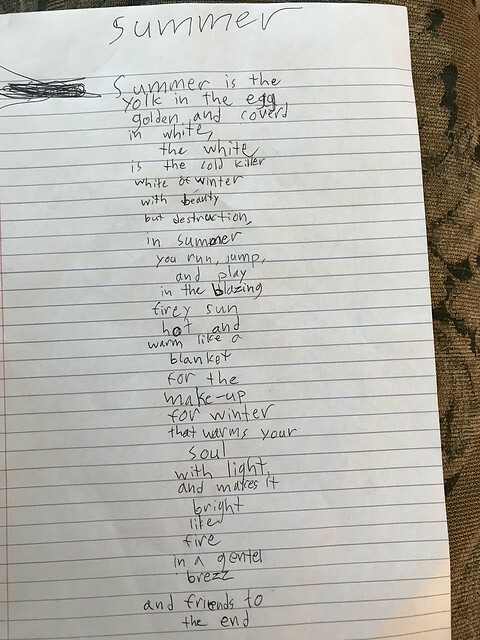 I asked them to write about their favorite season. Keith blew me away! That boy has an incredible talent. 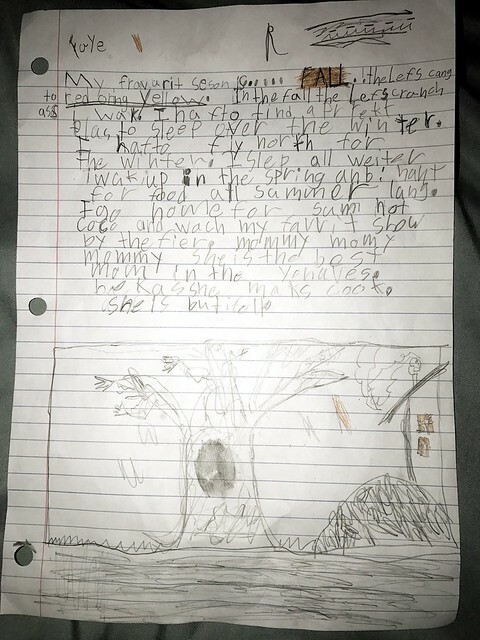 It took him all of 5 minutes to fill his paper with poetry better than I could have written. Faye worked on hers for a long time. It was absolutely wonderful having her and B quiet for 1.5 hours. It really made the day a lot easier than it otherwise would have been. She wanted to draw a picture on her paper. My favorite season is... FALL!! The leaves change to red, orange, yellow. In the fall, the leafs crunch as I walk. I have to find a perfect place to sleep over the winter. I have to fly North for the winter. I sleep all winter. I wake up in the spring and I hunt for food all summer long. I go home for some hot cocoa and watch my favorite show by the fire. Mommy, Mommy, Mommy. She is the best mom in the universe because she makes cookies. She is beautiful. Aww, so sweet of her! But really, that last bit was because I was making cookies as she was writing this. I forgot to take pictures of it, but today for quiet time, I pulled out my crafting things and we made some paper flowers. I wish I had taken pictures, but I was a little grumpy today and just wanted to go to bed. Unfortunately, Vince didn't go to sleep until half an hour ago, 10:00, so I am up much later than I had wanted to be. The good news is it isn't all that late right now, and I can go to sleep now! I'm hoping for another brain blast while I sleep because I honestly have no idea what to do for school time tomorrow, and today's reading really didn't go all that well, and they actually woke up T and Vince. Something for tomorrow that will keep them quiet during quiet time, and that will help them not have to be out in the sun during the hottest time of day. Because that is where they go when the other kids are sleeping.